← #SixSunday — An Outtake from The P.U.R.E. Today I have a special guest, Miss Aimee Laine, author of Little White Lies, Into the Unknown and her latest release, Hide and Seek. I am one of the lucky ones who got to read Hide and Seek in its infancy. I also remember the emails we exchanged when Aimee latched on to the idea of Laelaps and the Teumessian Fox, the ultimate paradox, as the basis for a love story. There is nothing more exciting than pitching concepts to a writer pal…OTHER than seeing it come its fruition. 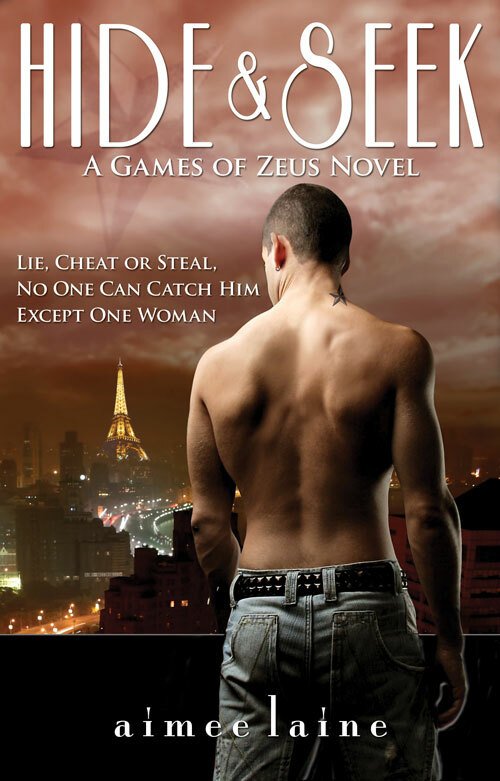 You’ll notice that the subtitle of Hide and Seek is “Games of Zeus”, a nice nod to the Greek mythology origins and to more delights Aimee has planned for future works. A fan of Greek mythology myself, I invited Aimee to answer a few questions about her use of mythology in her latest novel and in other works. Welcome Aimee! Let’s start with a few basic questions before we delve into Hide and Seek. Were you always mythology fan? What were your favorite stories? Well … the ultimate paradox is one. 😉 Actually, I’d always known about Medusa and her snake-head, Athena and her great warrior-ness, Aphrodite and love. Poseidon. Hades. Ares. Apollo and his flying feet. The twelve Olympians are my favorite. Zeus though, well … the stories surrounding him are so varied. The man was anti-monogamy, yet he supposedly had a favorite wife. He did not show mercy. Yet, he is revered. So, to me, he’s the best one to read about because his entire life is full of conflict and he happily endowed those conflicts onto others. How did you stumble across the fox / hound myth and then turn it into a love story? Totally an accident. I was just looking through myths and found that and thought, O.M.G. (to be totally teen) that’s the perfect conflict. And … tada(!) it’s one Zeus created and Zeus ended. How do you factor Zeus, and the other gods into your world-building? I do things TOTALLY different than most people. In my world, the ‘gods’ are the highest power, but at the same time, they are quite obscure. Are they publicly worshipped or acknowledged? Never worshipped. The gods are more ‘the rulers’. They are there to ensure peace and tranquility in the non-human/immortal races. Humans only believe them myths. They are responsible for maintaining the ‘secret’ of all the otherworldly creatures on the earth. Forces in the background who keep a low profile and only a privileged few know about them? Yes! ALL non-humans know about them. No humans do. If they are on earth, they are in human form. If they are on Olympus, they are in ‘god’ form. They don’t come to earth except when the secret is close to being shared outside the boundaries of what is allowed or if they have to mediate problems. No non-human wants the gods to descend. Ever. They do not have mercy … or so these earth-based people think. Does the average man on the street know Zeus plays games with them? Nope. In Hide & Seek, Lexi and Tripp know part of the game because they’ve done their mythological research. They’ve ‘Googled’ it for lack of a better explanation. So they know where it comes from (or assume). But there are very few that know. Since I’m assuming you lean more toward urban fantasy than fantasy, how do they mesh with the rest of the real world as we know it? The gods don’t really mesh. They do, but they don’t. If they are here, on the planet, they are humans without true ‘godly’ power. If they are on Olympus, they can look upon us and exact their wrath or their grace. In my world though, There are three levels to the ‘ruling’ of non-humans. There are the gods (12 of them). There is ‘the Council’ (12 of them) and then there are ‘the minions’ — the people who are part human or non-human. The Council does what it can to prevent the gods from descending. The gods though, will come if they want. No matter what, if any of them are in the presence of a human, they MUST BE IN HUMAN FORM. They have no choice but to blend with their environment. Is Emi Gayle (Aimee’s YA-writing alter-ego) also using Greek mythology in her stories? Emi writes her stories based on the same structure of Olympians — Council — Minions. This way, all our stories (Emi to Aimee and Aimee to Emi) can cross over — our characters can too. There is someone, or some place, in every one of my books that is reused in another book. For example, Emi’s debut After Dark is set in Rune, NC which is the same setting for Little White Lies and Hide & Seek. Hide & Seek and Little White Lies cross paths through the short called Misguided in the Into The Unknown Anthology. Hide & Seek and After Dark connect through a little restaurant called Dulces (which I totally made up but want to start!). In one little town, there are a lot of people and it’s easy to fill books with characters who never meet … unless they do. What other “Games of Zeus” do you have planned? Oh yeah. 🙂 Games of Zeus #2 is written and pending editing. This is Ian and Taylor’s story and it’s even more complicated than Hide & Seek because these two have no clue what they are up against. Silent Echoes plays on Zeus’ lack of monogamy, constant love triangles and his irreverent actions to torture people both in love and physically. This one is based on Zeus’ own love life, vs. a myth everyone knows. I think we’ll conclude on that salacious teaser, Aimee. Thank you so much for visiting! Aimee’s next novel, Surrender releases September 3, 2012 and is a sequel to Little White Lies. Lie, cheat or steal, no one can catch Tripp Fox. Except one woman. Thanks for dropping by, Julie! I agree, the premise of this novel is so fresh and fun! Yeah! Thank you so much for hosting me! 🙂 Had so much fun! I love mythology! All of it. Greek, Roman, Native etc. What a great concept, too. Humans out to prove that the “gods” exsist? That’s cool. THanks again to Aimee for sharing her world-building vision with us. I know, Dale! Totally cool!. My kids loved the Rick Riordon books and Edith Hamilton’s Greek Mythology so they’ve developed a fondness too.